The fifth one who performed was Lyca Gairanod on Semi Finals on The Voice Kids PH as of Saturday, July 19, 2014 at the Resorts World Manila, Pasay City on Newport Performing Arts, Theater. He sang “Pangarap na Bituin” and Coach Lea said that she can accomplished all her dreams in her life and if Nora Aunor is watching she will be glad to her. Previously, Lyca was the last kid who performed in the sing-offs. Lyca being a child of a scavenger did her best for her family. This gifted child sang “Dance with My Father Tagalog Version” that really stunned the audience, especially the coaches. Coach Bamboo appreciated her for telling stories of the song and she was so relaxed about her singing and the true color of her voice went out. Coach Sarah saw her potential and her desire to win despite the fact that she was not perfect. 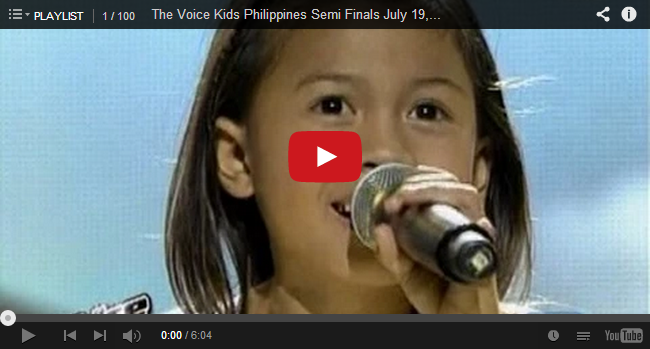 Watch Semi Finals: 'Pangarap na Bituin' performed by Lyca Gairanod on The Voice Kids PH below.